The girls seem to really enjoy history this year. We are using My Father’s World for 2nd grade history, but Lucy joins us for almost everything. She doesn’t want to be left out of this part of our day! The first couple of months, the girls learned about the history of the United States. They learned about various explorers, Pilgrims, Native Americans, George Washington, Benjamin Franklin, 13 colonies, Declaration of Independence, Revolutionary War, etc. Here is Norah writing with a quill pen. . . after talking about the Declaration of Independence and John Hancock. My mom picked up the quill pen and ink set when they were in Pennsylvania this summer. Now the girls are learning a little bit about each state – in the order in which they joined the union. While talking about the New England states – we enjoyed some clam chowder. Well, Kevin and I enjoyed it. Norah and Lucy did not (Daphne can’t have it because of her food allergies). Norah reluctantly ate the little bit we gave her. Lucy gagged and spit it out! It was slightly amusing – she has never done that before!! We made a peach cobbler when we talked about Georgia – that went over better than the clam chowder. When talking about South Carolina (and briefly about the Civil War) we talked about food the soldiers may have eaten. 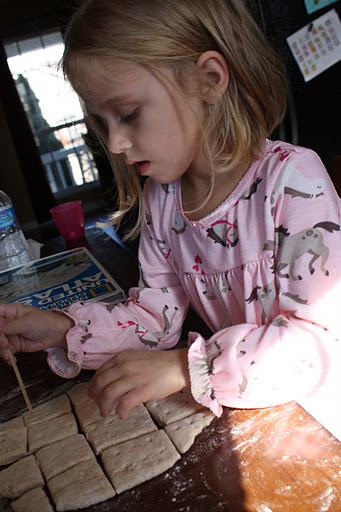 We made some hardtack – which is basically a hard biscuit, made with flour, water and salt. Sounds yummy, right? All three girls ate a whole piece, but decided they were glad they didn’t have to eat it again!! We also made yarn dolls – but I never took a picture of that. The girls enjoy telling Kevin what they have learned about each state. The second day of our state study (Pennsylvania), he asked the girls what they learned about the sports teams in PA. I think their response was, “Mommy didn’t teach us any of that.” Since then I have tried to teach them a random fact about a sports team – but they can’t seem to remember any of it. Either that or they think it is funny when Kevin questions them and they don’t answer. When we talked about MA, I told the girls about the Boston Red Sox. They couldn’t seem to remember anything I told them and they kept saying “stinky Red Sox” which was okay with Kevin! We are only 8 states in, but so far the way this curriculum is put together has been great for both girls! We are taking December off from our regular history to do some extra Christmas stuff, but I think we will all be excited to get back into the study of the states after the first of the year!! This entry was posted in Girls, Homeschooling. Bookmark the permalink.